Assam footballer Halicharan Narzary has agreed to join Chennaiyin FC on loan from Kerala Blasters for the rest of the season. According to a report in the local media, The defending champions of the ISL managed to rope in Narzary and CK Vineeth both on loan deals for the remainder of the season. Chennaiyin FC is involved in the upcoming AFC Cup competition in particular, apart from the league games. Chennaiyin coach John Gregory believes both Narzary and Vineeth are important addition to the squad keeping Super Cup and AFC Cup prospects in view. He also said that both of them bring experience and stability to the team with international exposure behind them. Meanwhile another Assam player Baoringdao Bodo has completed a permanent move from Chennaiyin FC to Kerala Blasters. Baoringdao is Chennaiyin’s youngest first team debutant making a couple of appearances in the club’s 2017-18 title winning season. 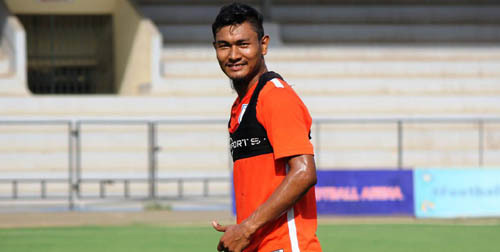 He was sent out on loan to Kozikhode-based I-League side Gokulam FC in the time being.